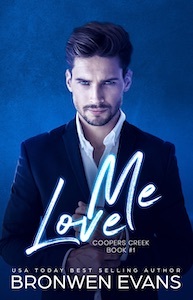 The first book in USA Today bestselling author, Bronwen Evans’s flirty new contemporary romance series… Love Me is an enemies to lovers, second chance romance story. Coopers Creek holds painful memories for Emily and Tyler. Can they forgive each other; can the town hold a beautiful new future for them both?